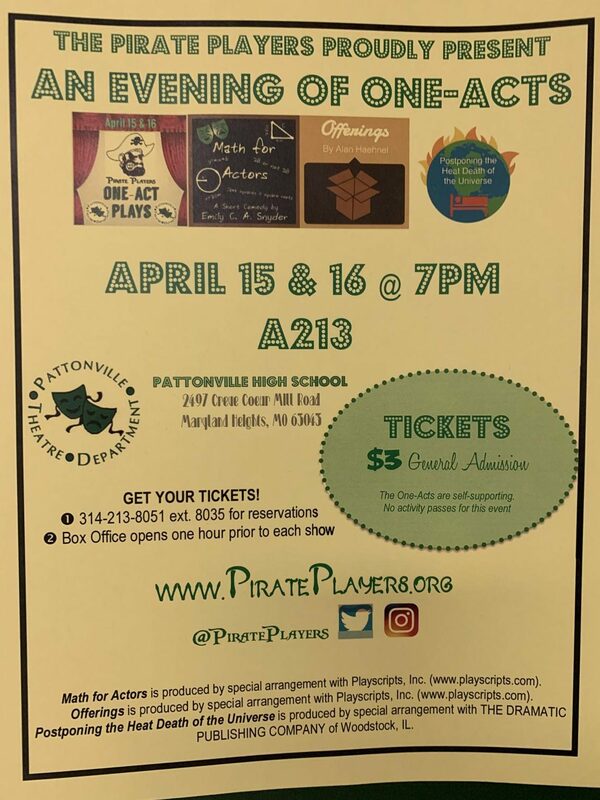 Pattonville’s One-Act plays will commence April 15-16 in Room A213. Shows start at 7 p.m. both nights. The first One-Act is being directed by theatre teacher Ms. Lara Corvera. It focuses on the monologues of people dropping off offerings. Aside from having a different storyline, the other two One-Acts have a major difference from “Offerings.” They’re being directed by current high school students. To be selected as a director, students had to pick the One Act and submit preliminary director’s notes complete with stage directions and costume ideas. This year’s students are Kaitlyn Kelly (“Postponing the Heat Death of the Universe”) and Lacey Harder (“Math for Actors”). “Postponing the Heat Death of the Universe” centers around Nick after he loses an essay contest and now spends his time moping in his room postponing entropy, and “Math for Actors” spotlights a young man who falls in love with a math tutor, so he plays dumb to keep her around. Be sure to come support Pattonville theatre students on (and behind) the stage by purchasing tickets for the shows. Tickets are $3 for general admission.